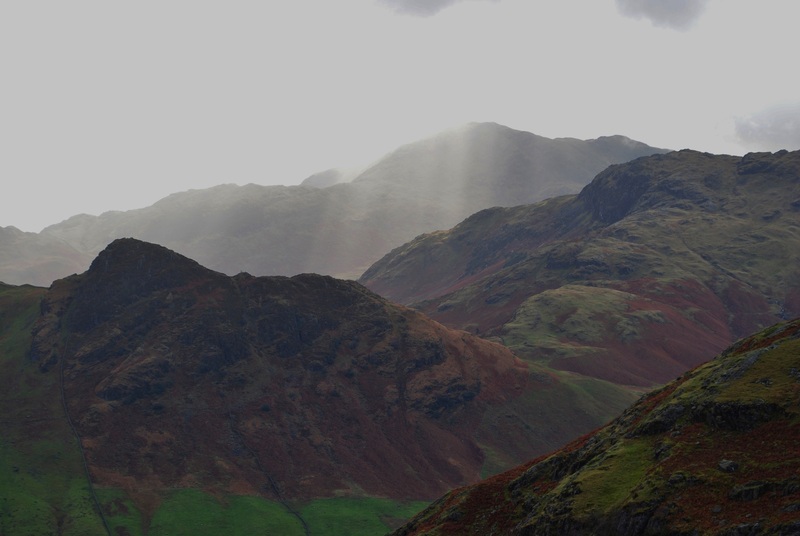 and many thanks to all followers and supporters of HeritageLandscapeCreativity. 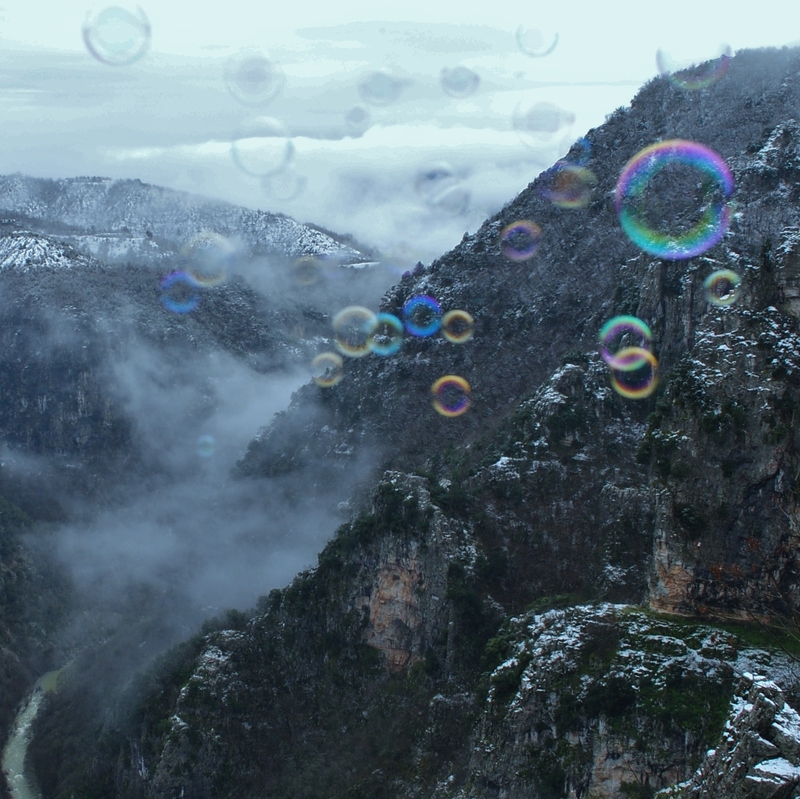 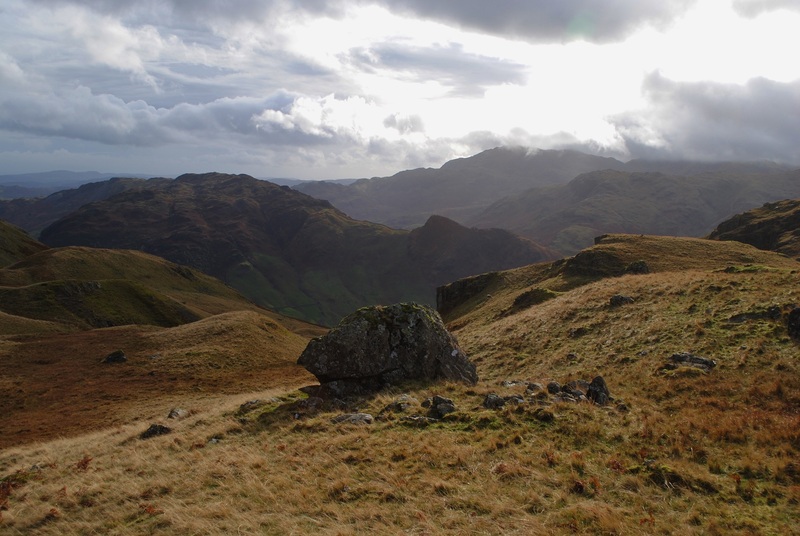 Winter is a great time to get out and explore the Heritage of Landscapes. 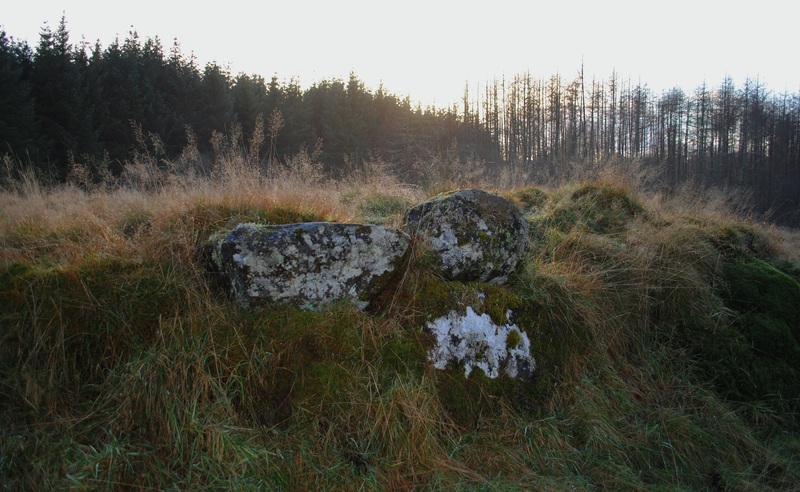 The prehistoric site at Barr A’ Chaistealain has been described as a dun. 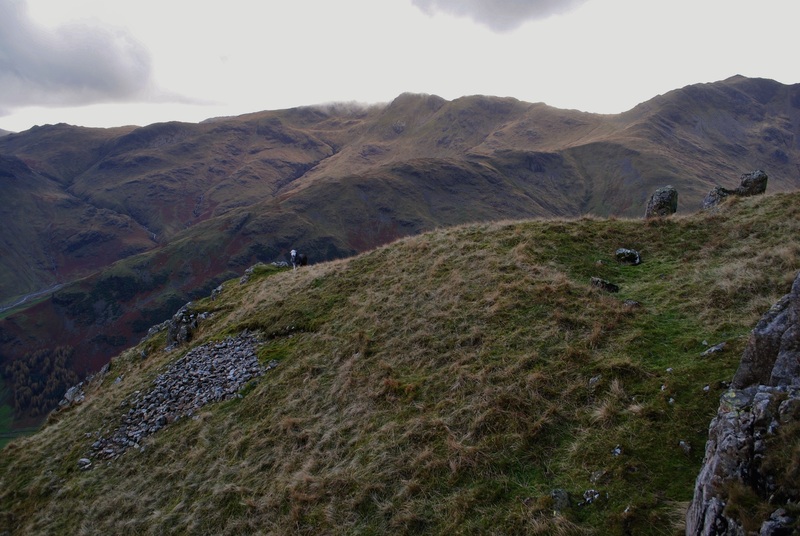 Around which the remains of a Medieval or Later Rural Settlement can be found. 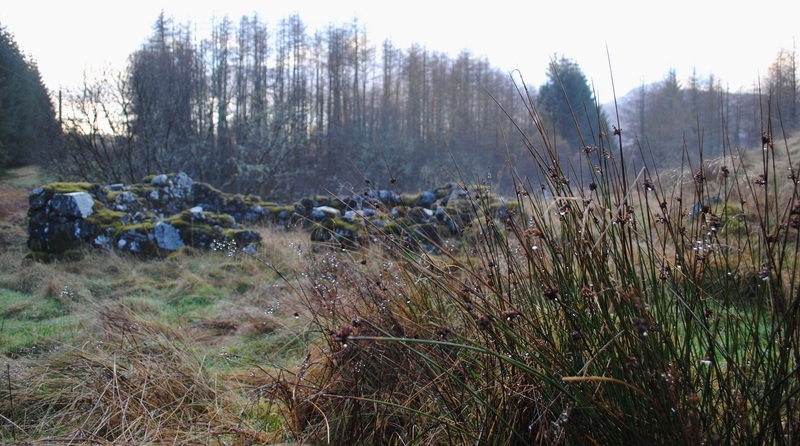 The settlement is associated with the Clan McNab. 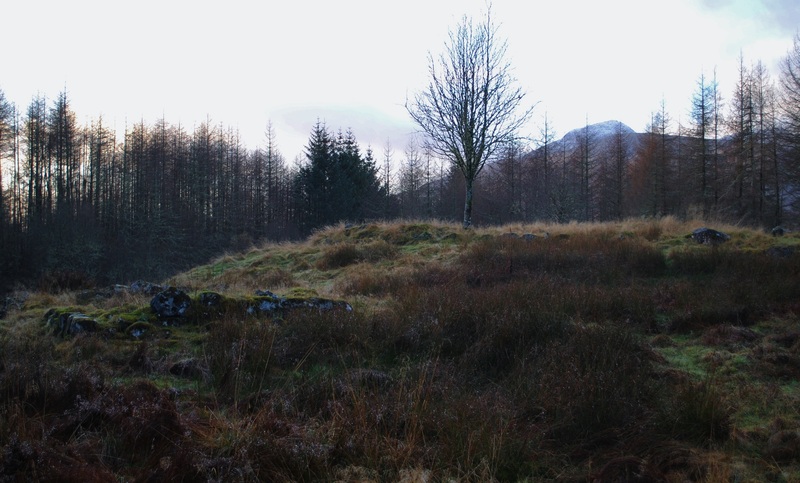 It is said to have been occupied by the McNabs in the mid fifteenth century AD and that they were armourers and blacksmiths to the Lairds of Glenorchy. 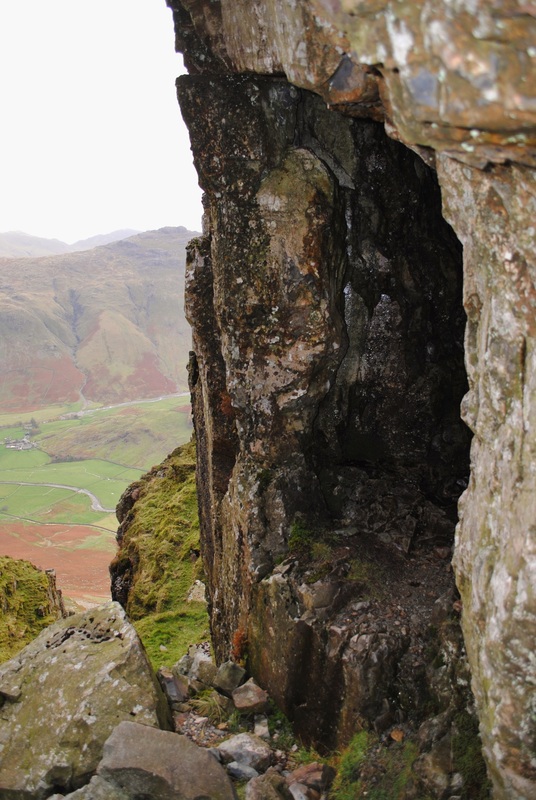 perhaps the bedstead relates to this last dwelling. 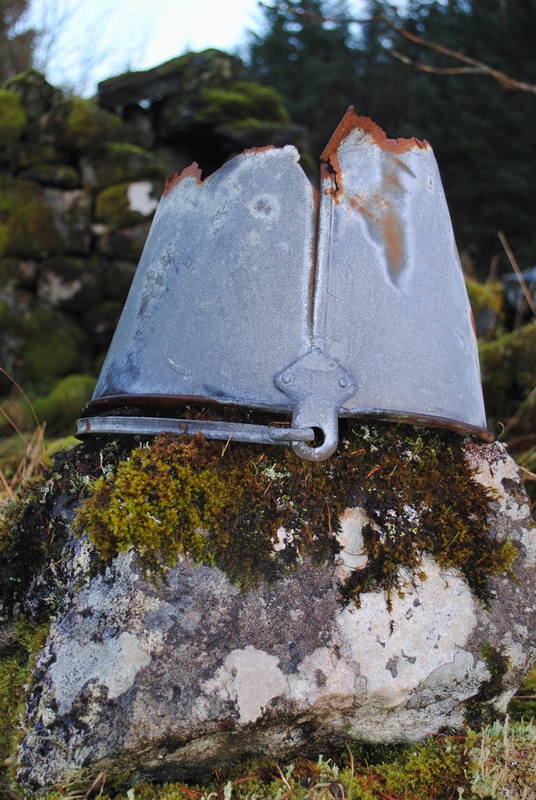 that such abandoned artefacts slowly corrode. 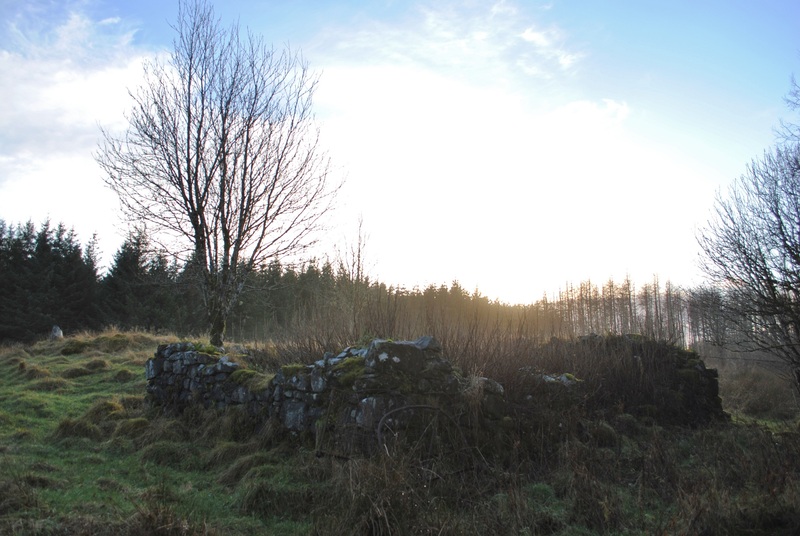 Barr A’ Chaistealain was clearly occupied, at least intermittently, for over a thousand years and had a strong association with iron working. 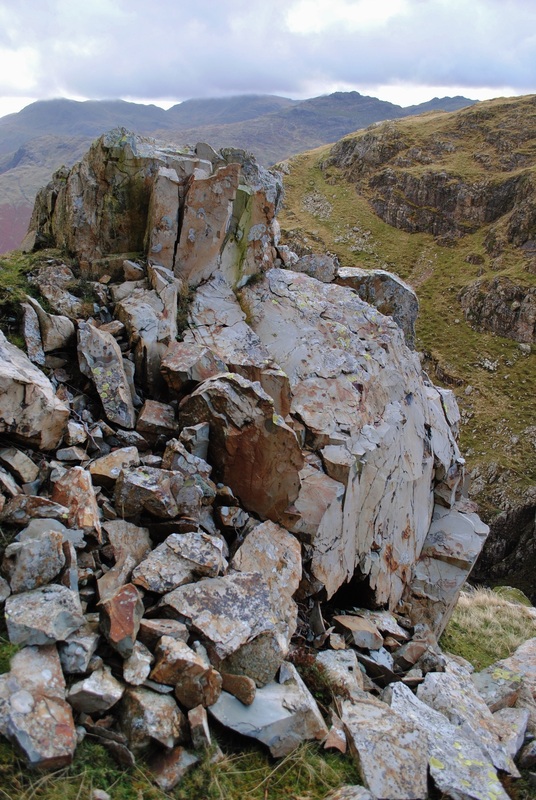 It could be described as an example of ‘the long iron age’. 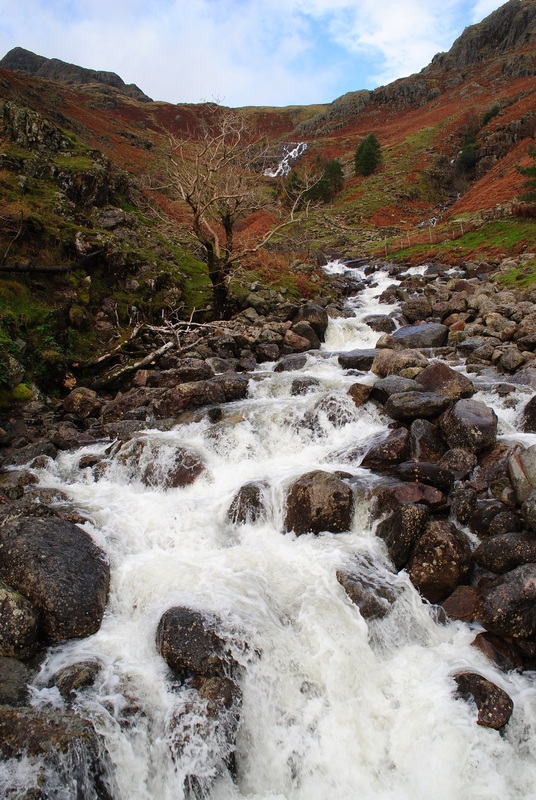 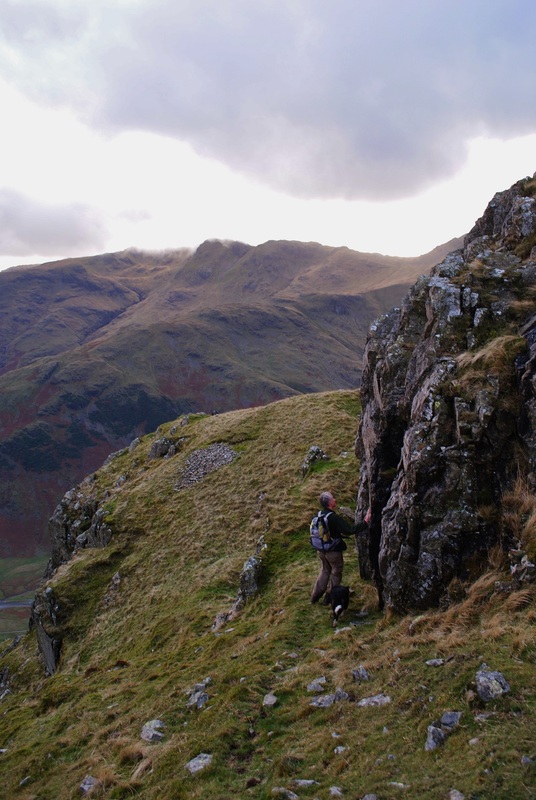 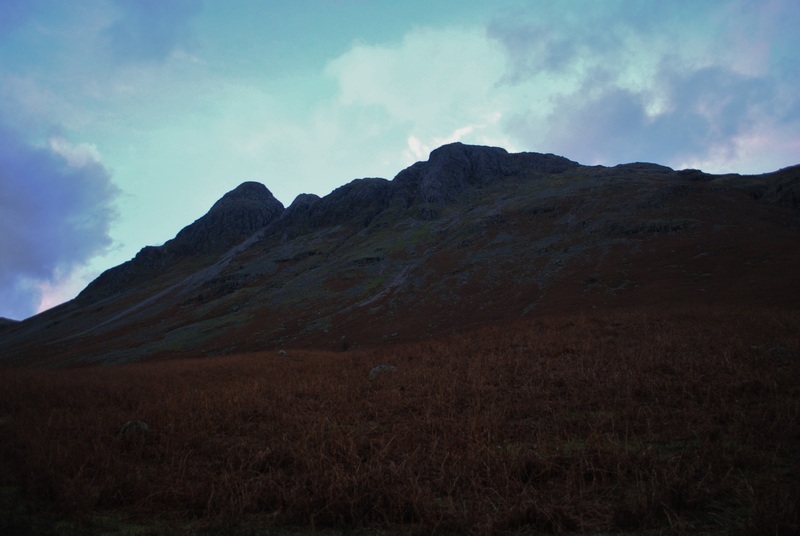 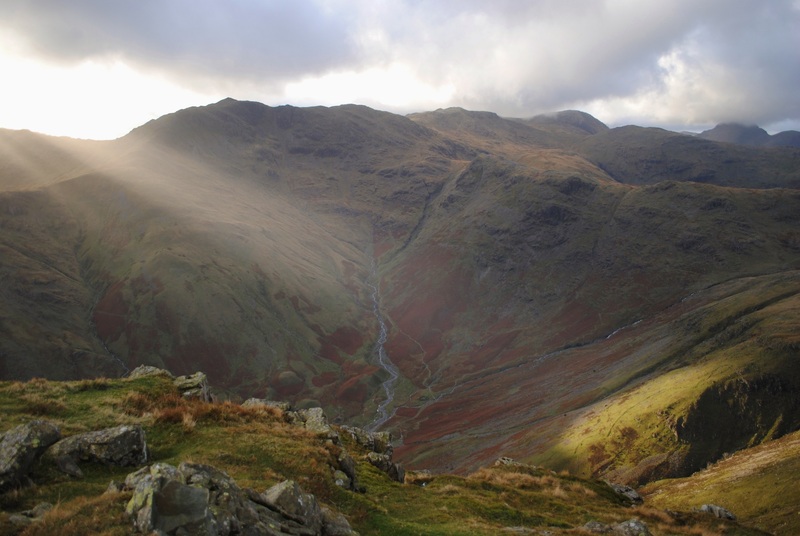 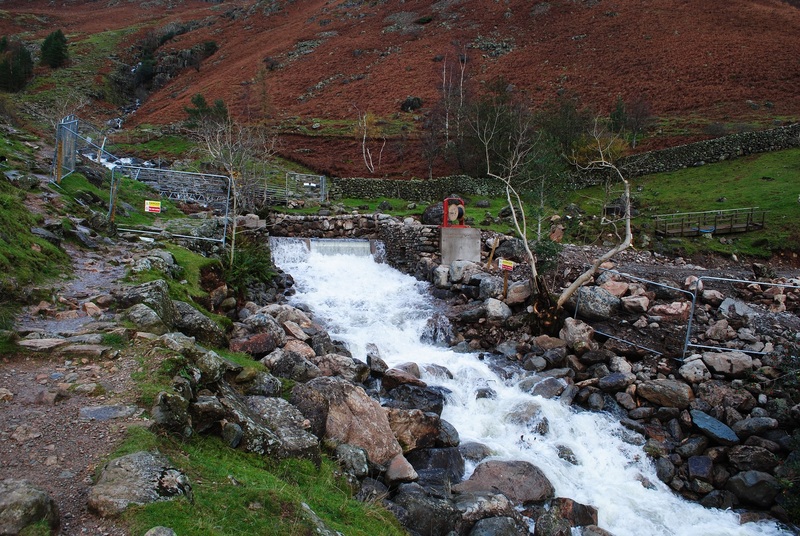 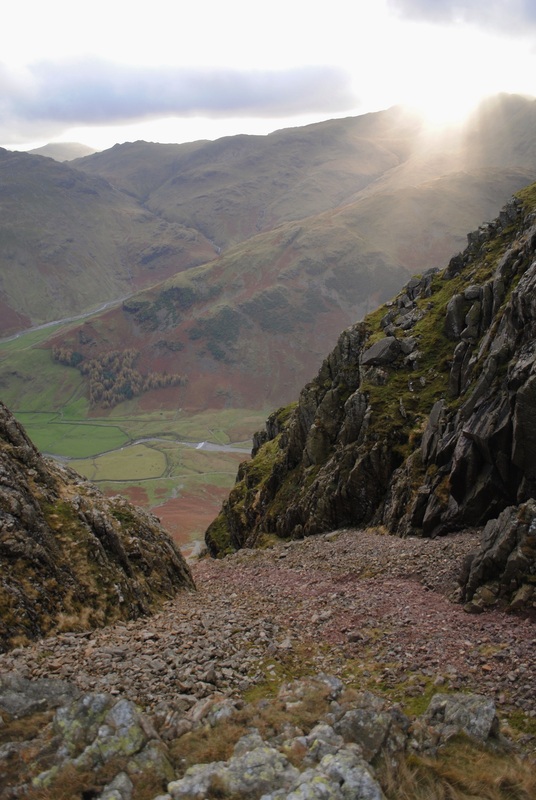 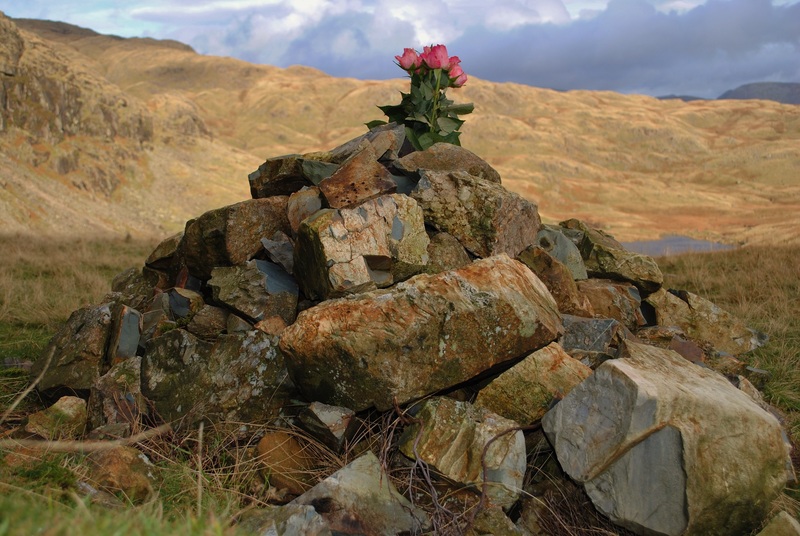 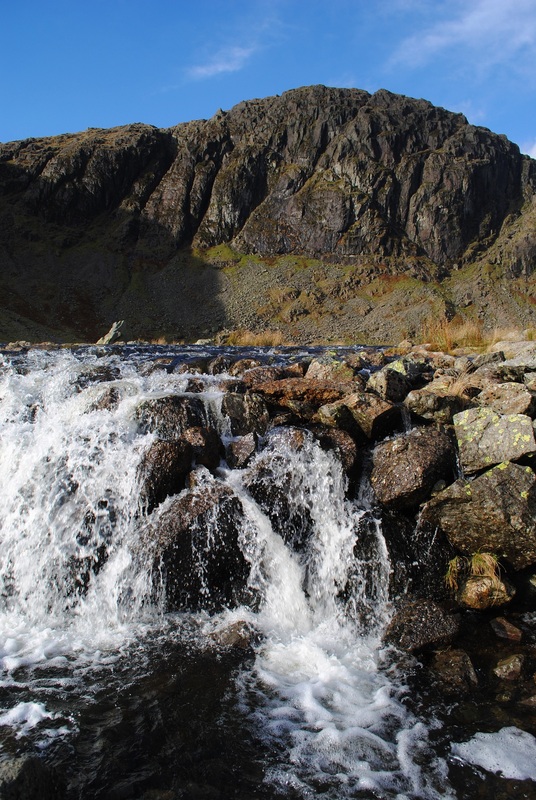 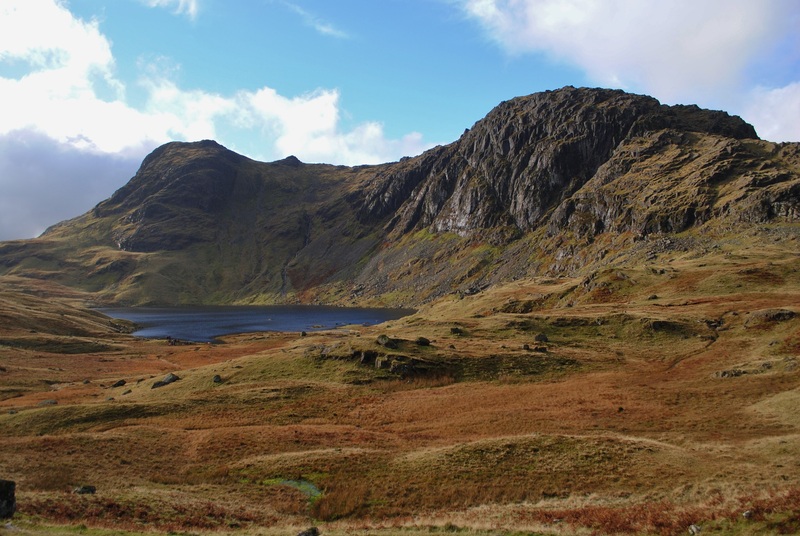 Many thanks to Peter Style who kindly led me through the Langdale Axescape: please visit his blog Mountains of Meaning. 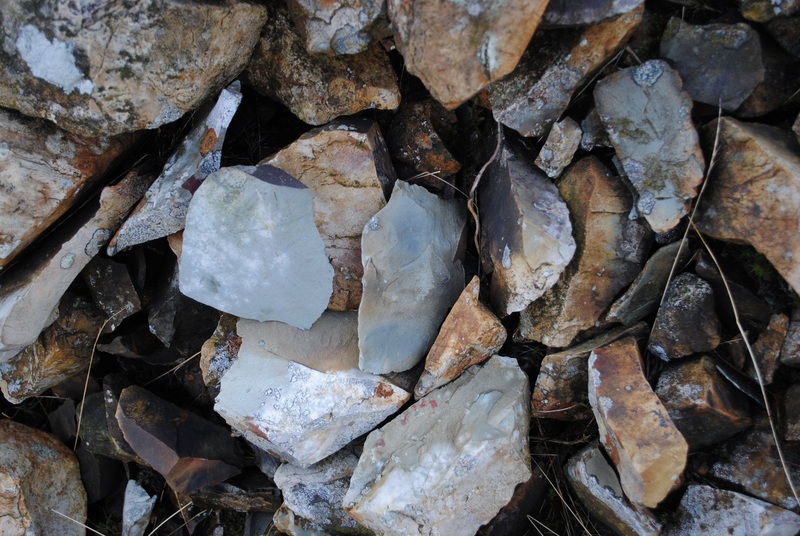 In the Central Lakes, high up on the mountain sides, there is a marked band of geology, a fine grained tuff, which was sought in the Neolithic period for producing stone axes. 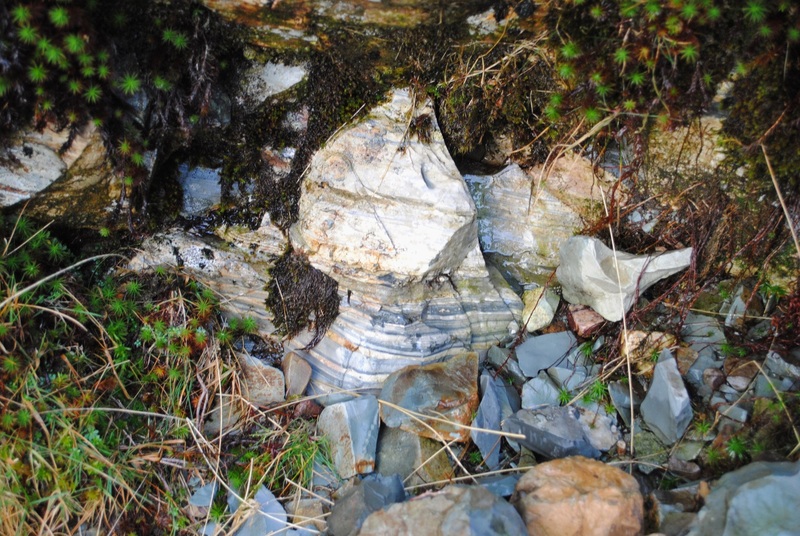 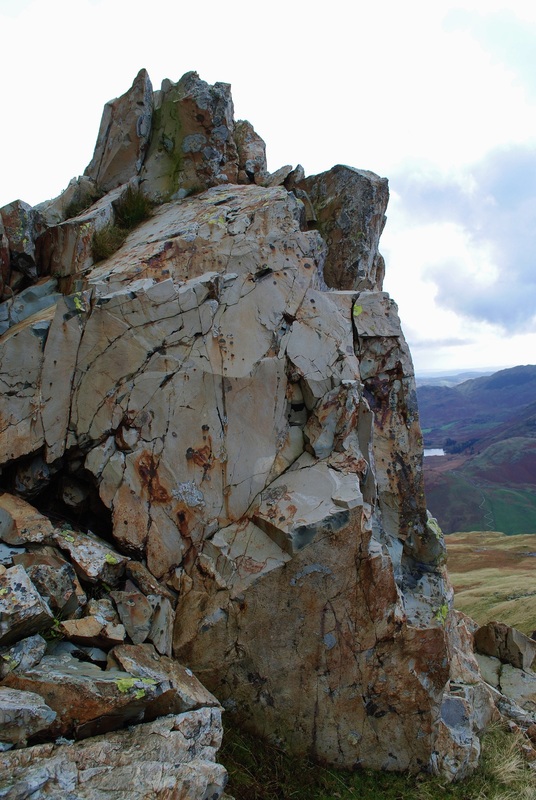 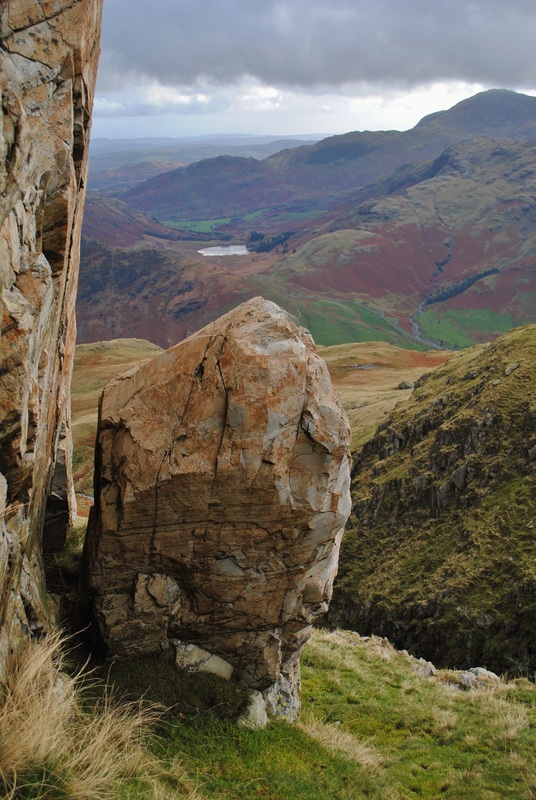 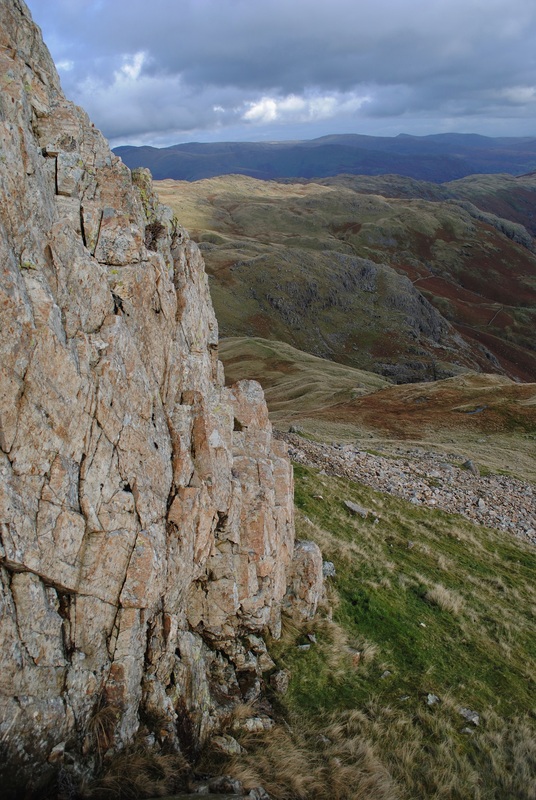 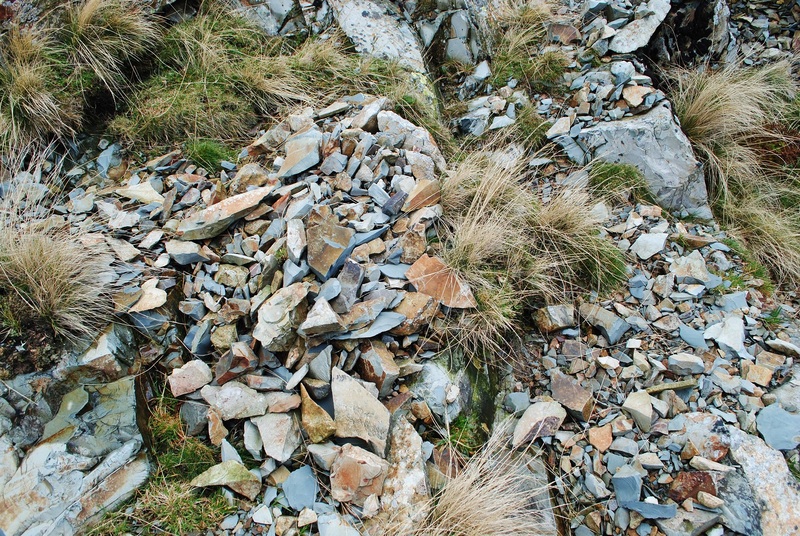 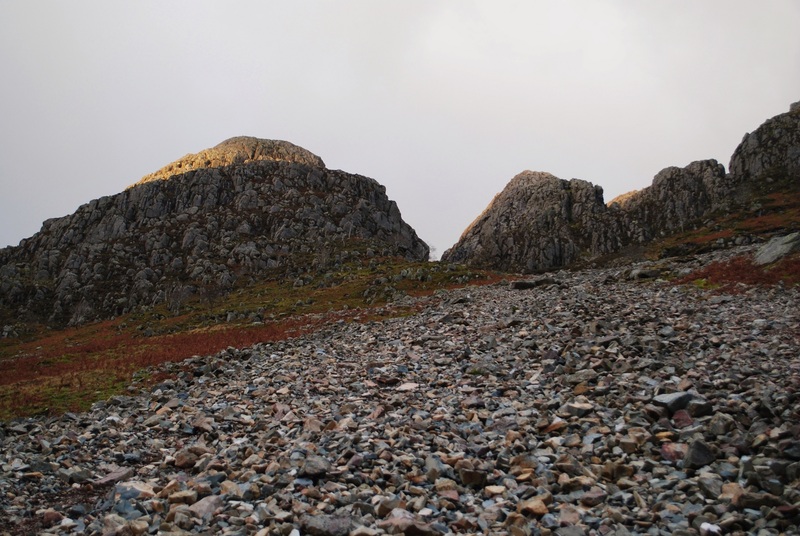 The lumps and flakes of stone which can be found prolifically on the mountain side (and should be left where there), are the working debris from quarrying and from roughing out stone axes from this tuff approximately 5500 years ago. 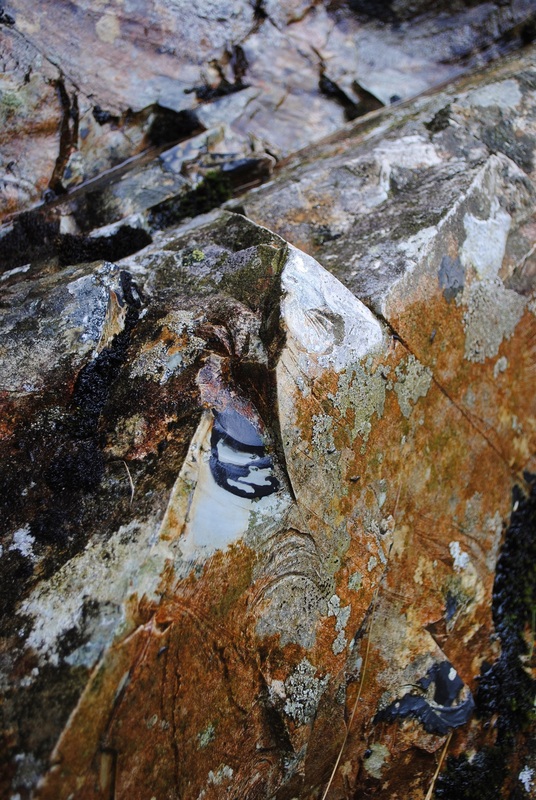 The rough outs would be worked further and typically polished to create a smooth lustrous finish to the axe. 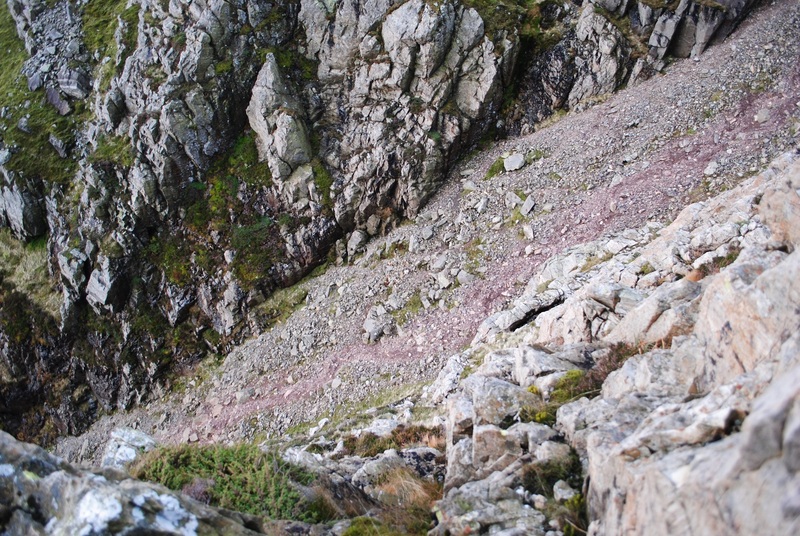 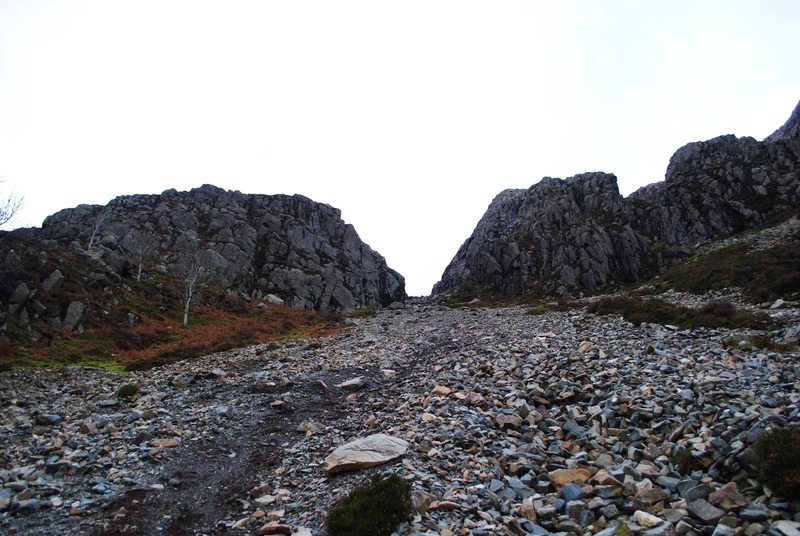 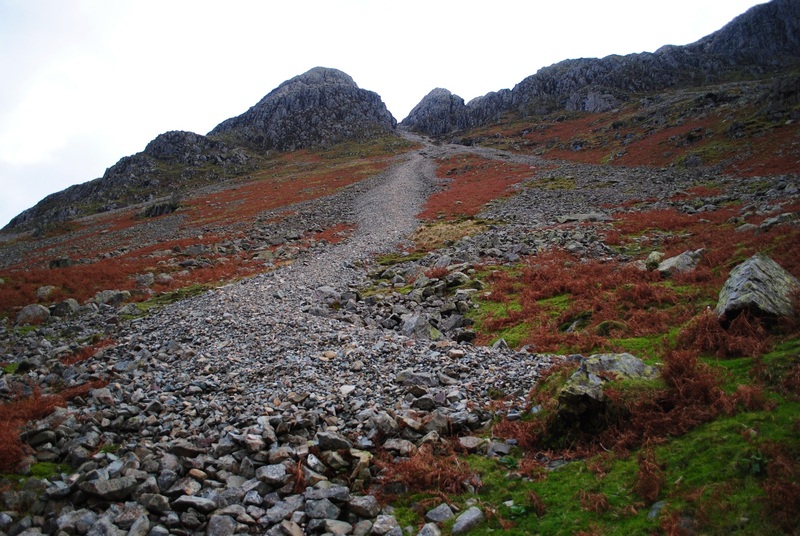 Descent from Pike of Stickle beyond the edge of the scree slope is possible only with great care: indeed as a sensitive archaeological site it really should be avoided. 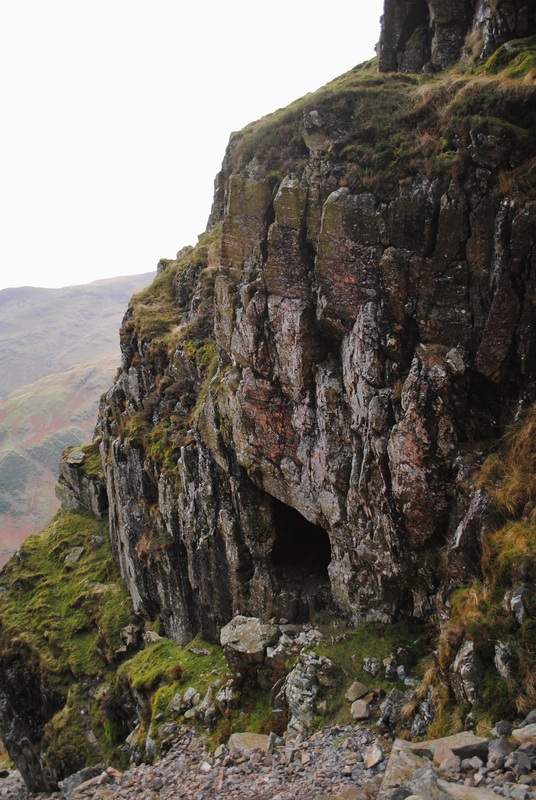 This is demonstrated by example of the cave found down the stone shoot. 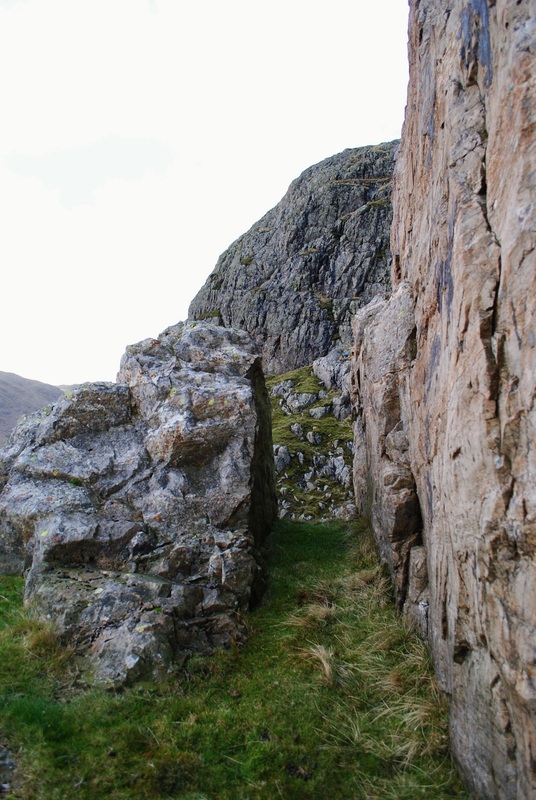 It has clearly been quarried into the rock face and there is a photo from the 1940s (in the Clare Fell 1950 article ‘The Great Langdale stone-axe factory’ in Transactions of the Cumberland and Westmorland Antiquarian and Archaeological Society) which apparently shows that only the top of the cave was visible. 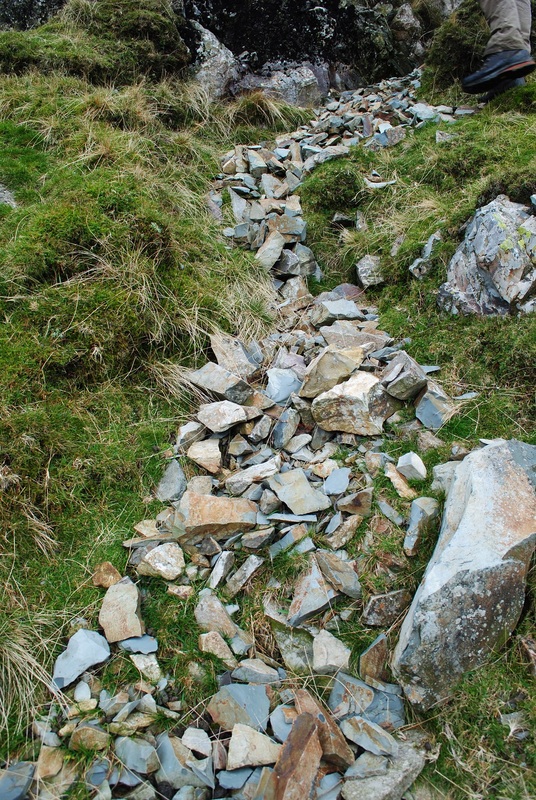 The remainder was sealed by several meters of axe working debris. 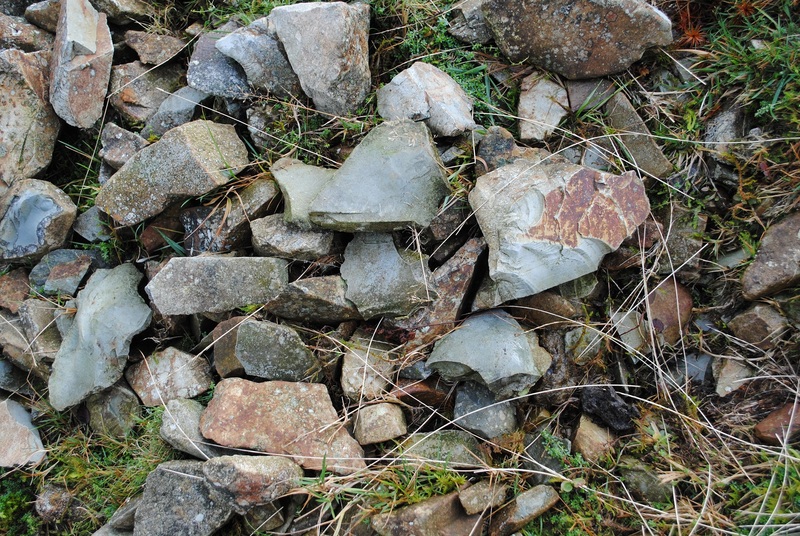 In the intervening sixty years, tons of material has moved down the hill, despite probably having remained largely untouched for several millennia. 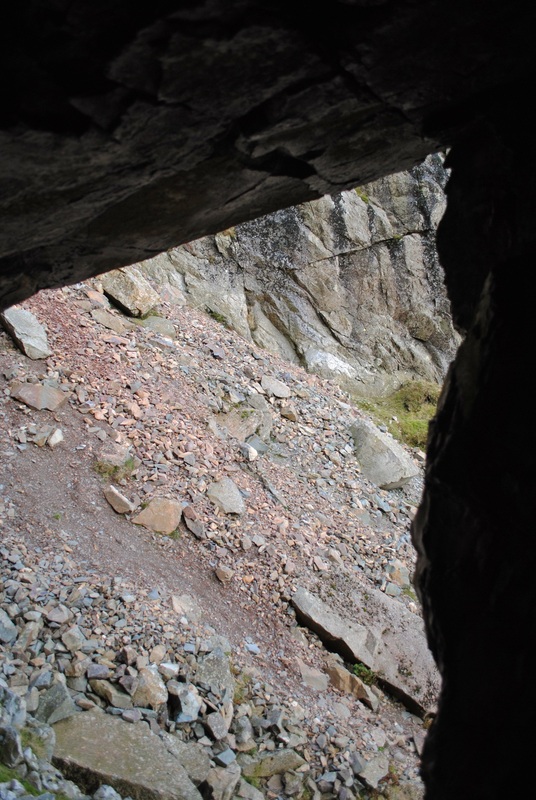 Why the cave was quarried and what this cave was used for within a wider axescape is unclear. 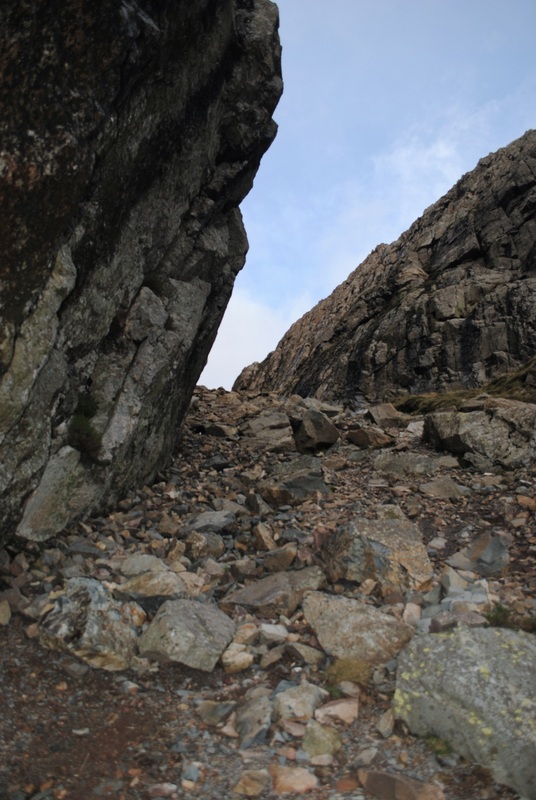 Whether as a location for polishing stone axes, or perhaps a place where one or two people could shelter as stone showered down from quarrying taking place above, the sounds echoing on the sides of the shoot. 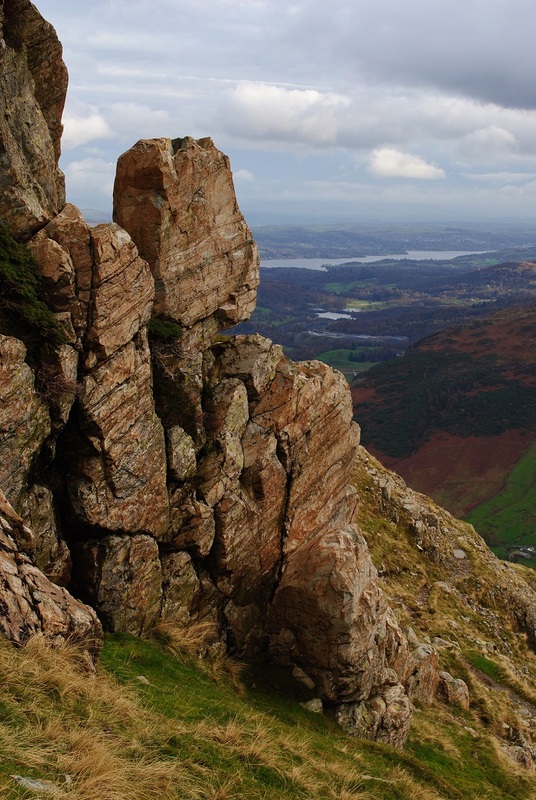 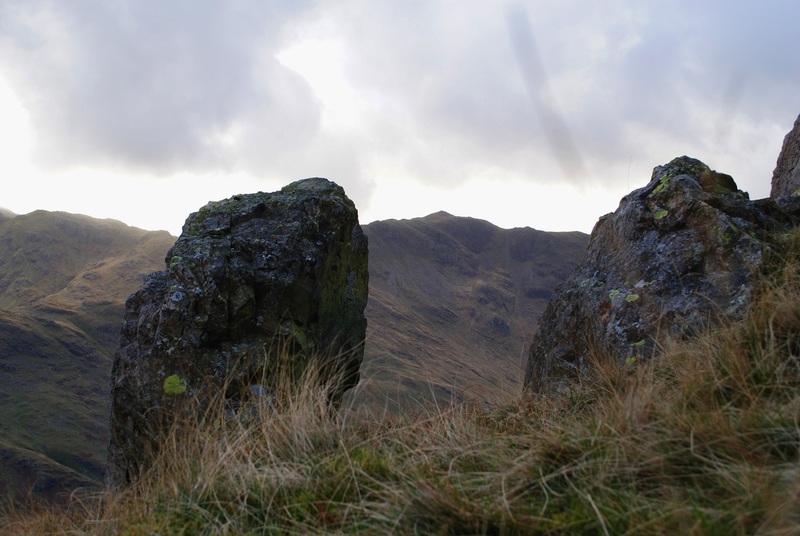 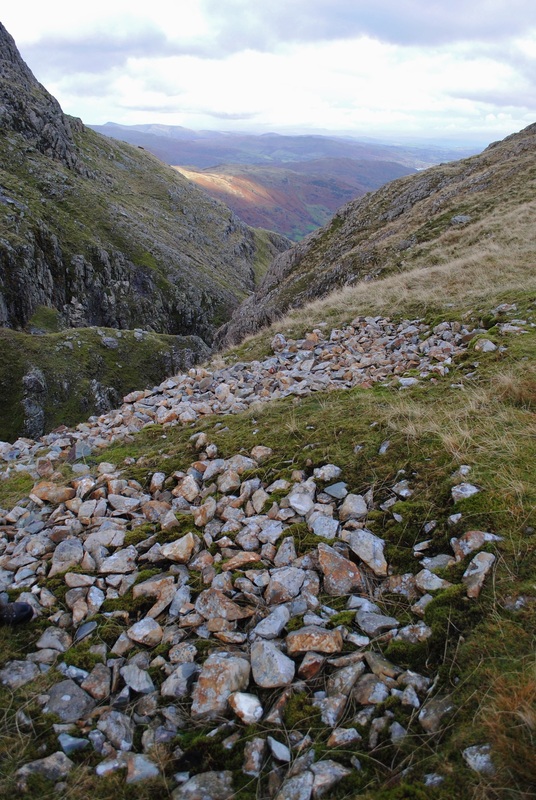 Further background information on prehistoric axe working sites in the Lake District can be found in the Oxford Archaeology survey report On Axe Working Sites On Path Renewal Schemes.